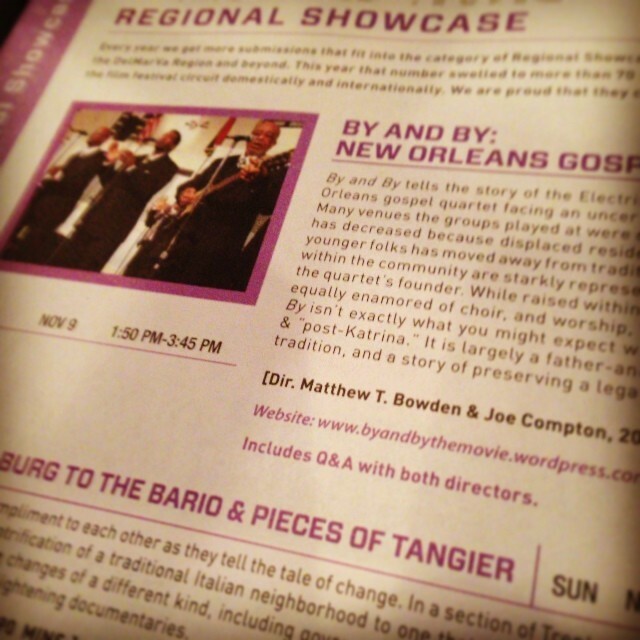 Many thanks to the Rehoboth Beach Independent Film Festival, By and By‘s last screening of 2013 — fingers crossed for more to come! By and By screens at the Rehoboth Beach Independent Film Festival on Saturday, November 9th at 1:50 p.m. Tickets and screening info are here — hope to see you there! Mahalia Jackson would have been 102 today. In case there’s any doubt, this By and By clip makes clear she’s still with us. At NOLA’s Zeitgeist Theatre for a “By and By” screening on April 30 — a Gospel Tent’s worth of musicians under one roof: Andrew Jackson (Rocks of Harmony), Ruby Ray and Mrs. Sally (Spiritualettes), James and Lynn Williams of ECS, with (of course) Jo Cool Davis in the foreground. NOLA/Jazz Fest photographer Michael P. Smith was a primary inspiration for the work we did on “By and By” — NPR gives a little love to those folks who hop from tent to tent. The Baltimore Sun’s MFF preview video makes clear that “By and By” is in great company! “Hit and Stay”; “12 O’Clock Boys”; “I Used To Be Darker” — on and on. And as the video reveals: THE CROWNSEEKERS WILL BE PLAYING AT THE MARYLAND FILM FEST (including our screenings)! You’re going to be there, yes?